This is part of a great Wikipedia Article, read more here…. The Teller–Ulam design is the nuclear weapon design concept used in most of the world’s nuclear weapons. It is colloquially referred to as “the secret of the hydrogen bomb” because it employs hydrogen fusion to generate neutrons. However, in most applications the bulk of its destructive energy comes from uranium fission, not hydrogen fusion. It is named for its two chief contributors, Edward Teller and Stanisław Ulam, who developed it in 1951 for the United States. It was first used in multi-megaton-range thermonuclear weapons. As it is also the most efficient design concept for small nuclear weapons, today virtually all the nuclear weapons deployed by the five major nuclear-armed nations use the Teller–Ulam design. separation of stages into a triggering “primary” explosive and a much more powerful “secondary” explosive. compression of the secondary by X-rays coming from nuclear fission in the primary, a process called the “radiation implosion” of the secondary. heating of the secondary, after cold compression, by a second fission explosion inside the secondary. The radiation implosion mechanism is a heat engine exploiting the temperature difference between the hot radiation channel, surrounding the secondary, and the relatively cool interior of the secondary. This temperature difference is briefly maintained by a massive heat barrier called the “pusher”. The pusher is also an implosion tamper, increasing and prolonging the compression of the secondary, and, if made of uranium, which it usually is, it undergoes fission by capturing the neutrons produced by fusion. In most Teller–Ulam weapons, fission of the pusher dominates the explosion and produces radioactive fission product fallout. Pulsars are so-called because of the way their radio emission is detected at Eart. Astronomers have discovered what they say is the mightiest neutron star yet. The super-dense object, which lies some 3,000 light-years from Earth, is about twice as massive as our Sun. That is 20% greater than the previous record holder, the US-Dutch team behind the observation tells the journal Nature. Like all neutron stars, the object’s matter is packed into an incredibly small space probably no bigger than the centre of a big city like London. “The typical size of a neutron star is something like 10km in radius,” said Dr Paul Demorest from the National Radio Astronomy Observatory (NRAO), Charlottesville, US. The size is easy to understand but the densitiy is much more extreme than anything we know here on Earth. “It’s approximately the size of a city, which for an astronomical object is interesting because people can conceive of it pretty easily; and yet in that space it has the mass in this case about two times our Sun. So the size is easy to understand but the densitiy is much more extreme than anything we know here on Earth,” the study’s lead author told BBC News. The finding is important, says Dr Demorest’s team, because it puts constraints on the type of exotic material that can form a neutron star. Such objects are thought to be the remnant cores of once giant stars that blew themselves apart at the ends of their lives. 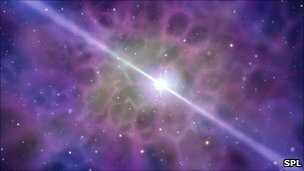 Theory holds that all atomic material not dispersed in this supernova blast collapses to form a body made up almost entirely of neutrons – the tiny particles that appear in the nuclei of many atoms. As well being fantastically compact, the cores also spin incredibly fast. This particular object, classified as PSR J1614-2230, revolves 317 times a second. It is what is termed a pulsar – so-called because it sends out lighthouse-like beams of radio waves that are seen as radio “pulses” every time they sweep over the Earth. The observations were made using the Green Bank Telescope in West Virginia. The pulses are akin to the ticks of a clock, and the properties of stable neutron stars make for ultra-precise time-pieces. 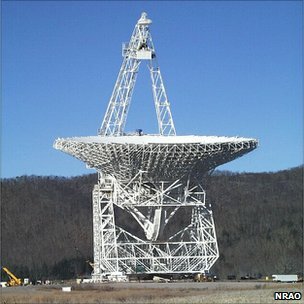 This was how the team, observing with the Green Bank Telescope in West Virginia, was able to measure the object’s mass. Because PSR J1614-2230 also circles a companion star, its pulses – as received at Earth – are disturbed by the neighbour’s gravity. “The way it works is that as the pulses travel from the neutron star past the companion, they slow down a little bit. And how we see that on Earth is that the pulses arrive a little later than we would otherwise expect when the neutron star is lined up behind the companion,” Dr Demorest said. The team could use this effect to calculate the masses of both bodies. The group reports a pulsar mass 1.97 times that of our Sun – significantly greater than the previous precise record of 1.67 solar masses. The result is said to put limits on the type of dense matter that can make up the cores of these bizarre objects. Some scientists had suggested exotic particles such as hyperons, kaon condensates or free quarks could exist deep inside neutron stars. But Dr Demorest and colleagues believe their observations preclude this possibility. “It’s simply that if those particles were formed, the star would get too dense and collapse into a black hole prior to this point,” the NRAO researcher said. This is a pancetta / dry cure bacon which is really very good. In this version I have split half an Old Spot Belly (skin removed). Each bag has a 630g slice which has two versions of the cure. 2) Ratio for dry cure mix is 30g/kg. So for this we need 18.9g. I round up to 20g. 4) Then I take the following mix and add to my cure bowls, Dried Sage, Pinch salt, Pinch Brown Sugar, Large Pinch Pepper or Several Crushed Juniper Berries. 5) Make up a vaccum bag and make sure you do a double seal on one end. 6) Add the cure to the bag, then add the meat, give a shake to distribute and quickly seal the end. If you are not quick fluids will come out of the meat and make it impossible to seal the bag. 7) Double heat the seal to ensure it is firm or make a second seal. 8) Rub all over but not to generously. 9) Leave in fridge (very cold one) for 1 day for every ½ inch + two days. In this case It was 2.5” so that is 5 days + 2 days is 1 week. I turn every day to get fluids evenly spread. 10) Gently rise in cold water discarding fluids and washing away thoroughly. 11) Place bacon on metal rack in tray to dry for a while then cut in to chunks. 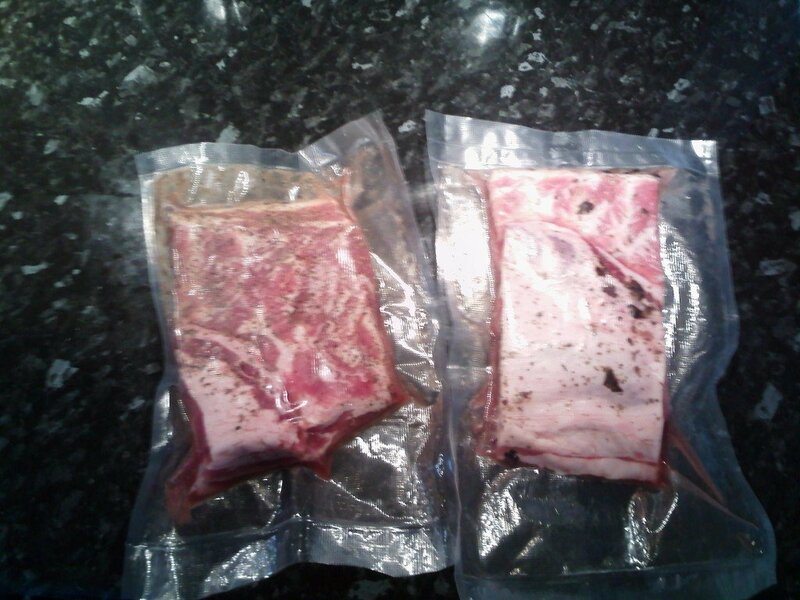 12) Either vacuum pack or simply bag up for freezer or use within a week or so. You will find that you might want to add extra salt as I do as I have found that the bacon is not salty enough. Also I think if you leave a little longer than a week it is also ok. Don’t worry about going over on cure time. This is my first and best so far for a standard Pork Sausage. This one should work well and be close to what you can get in the supermarket but better. The ingredients must be the best and that will reflect in a good final product. You can modify the spice mix as much as you want but I would leave the ingredients as they are as they balance quite well and chemically seem to work. However, you might actually get away with more emulsifiers such as mustard and egg. 160 gram Fresh White Breadcrumbs. 9 ice cubes for adding later. 1) Chill meat to very cold, then remove skin and discard, dice into 1” cubes. Put back into fridge for 1 hour. Add 5 ice cubes. 2) Mix all the ingredients from fresh i.e. grate nutmeg, grind peper etc.. to make a smooth paste then add the cubes. You can adjust the herbs as you wish or add garlic etc..
3) Mix the ingredients using a wooden spoon very thoroughly with pork cubes and return to the fridge. 4) Setup grinder on medium grind. Grind pork in 2 stages returning to fridge asap with remaining 4 ice cubes. When you have ground all the meat, remove from fridge and mix for about 5 minutes until very sticky. Return to the fridge to get really cold. 5) Take Pig Intestine cases, rinse and soak for 30 minutes in cold water. Then feed onto the suffer nozzle which should be set upright in the bowl of water. Then hold the cases from top up to feed on smoothly. 6) Setup the stuffer ensuring you have removed the blade. Remove the ice cubes which have not melted from the mix. Stuff the sausages as quick as you can, making sure the cases feel quite full. 7) Weigh into 1lb lots which is about 5/4 sausages and then pat dry and vacuum pack for freezer. You must keep the mixture very cold or the fat breaks from the meat and the texture is poor. If the pork shoulder is low on fat the belly should balance things. Make sure the mixture is wet as the breadcrumbs need it. Mix for a long time to enable the salt to start to break down the myosin protein strands to emulsify the sausage. Don’t overcook and use a thermometer to check when they are done, it is surprising how quick they cook.